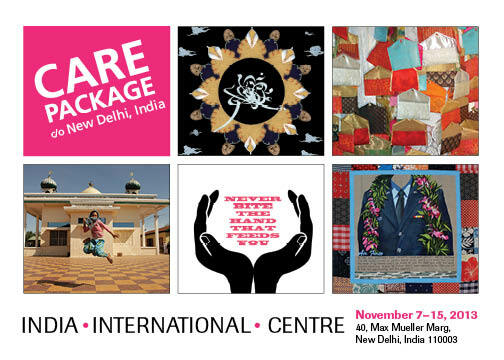 IIC is thrilled to announce its upcoming exhibition, CARE Package c/o New Delhi, India, with an opening reception on November 8th, 2013. The show runs from November 7–15, 2013. Inspired by the concept of “CARE Package”, the exhibition brings together five international women artists from Asia or of Asian descent, touching venues in North America as well as Asia. 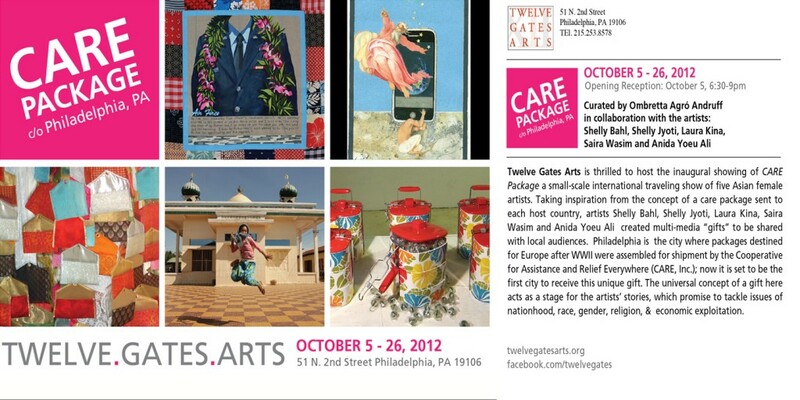 The exhibition debuted in the USA at Twelve Gates Gallery in Philadelphia (October 2012) and is traveling next to IIC, New Delhi before going on to Phnom Penh, Cambodia [the city named in the title changes according to the hosting location]. A rich tradition exists throughout Asian countries of gift packages exchanged as social contract and, while unwritten, they embody strong cultural, social, political and economic codings. In North America, care packages are associated with gifts sent from loved ones to their children and youth who are away from home (usually off to camp, college, or the military). Historically the CARE package was the unit of aid at the core of the food relief effort developed in 1945 by the USA-based humanitarian CARE organization and was sent to a large number of Europeans at risk of starvation in the wake of World War II. It soon became an icon of American generosity and global leadership. In an era where the concept of “American generosity and global leadership” is a far cry from its meaning during the post-war years and very much up for debate, the participating artists tell stories that grew out of their own personal history and cultural heritage to tackle issues of nationhood, race, gender, religion, and economic exploitation on a world scale, in the context of emergent global capitalism. Storytelling and a deep interest in history and untold stories is a shared strategy amongst this newly formed collective of interdisciplinary women artists who have historical and contemporary links to disparate geographies such as India, Pakistan, Japan, Cambodia, Canada and the USA. In a grass roots diplomatic effort, they are collaborating with an Italian, New York/ Miami-based curator to conduct a trans-cultural dialogue between their works, their countries of origin, and the intersections and migrations between. Artists: Shelly Bahl (born in Benares, living between New York and Toronto); Shelly Jyoti (Born in Rohtak, living in New Delhi); Laura Kina (born in Riverside, CA, to a Japanese father and Basque/Anglo mother, and living in Chicago); Saira Wasim (born in Lahore, living in California); and Cambodian-American Anida Yoeu Ali (born in Battambang, Cambodia, raised in Chicago, currently living in Phnom Penh, Cambodia). This New Delhi exhibition is organized by India International Centre. Shelly Bahl is a visual and media artist born in Benares, India, and currently based in New York City and Toronto. She received her B.F.A. (Visual Art and Art History) from York University, Toronto and her M.A. (Studio Art) from New York University. Her interdisciplinary work in drawing, painting, sculpture/ installation, photography and video, explores surreal narratives of the lives of trans-cultural women. Her work has appeared in a number of solo and group exhibitions in North America and internationally over the past 18 years. The Sweetest Gift explores the nature of gift giving in a globalized economy, via an abandoned suitcase filled with candy. The artist explores the power relationship between the gift giver and the recipient. This dynamic will be reflected in the highly controlled enactment of the gift exchange, with detailed instructions on a note-card next to the suitcase. The gift recipients will have to explore their own fears of the unknown and trust issues in their choice to consume the gift of candy from a stranger. Shelly Jyoti is a visual artist, fashion designer, poet, an independent researcher and a curator whose research centers on design and visual representation within the cultural context of Indian history. She is trained in fashion design and clothing technology at the National Institute of Fashion Technology, New Delhi and earned her Master’s degree in English Literature from Punjab University in Chandigarh. She lives and works in New Delhi, India. Her writings and paintings have been published and exhibited in India & internationally. The installation Reciprocity of love: Shagun (2012) is inspired by Marcel Mauss book “Gift” (1923) which notes the expressions of love that helps balances the power of relationships in the tradition of reciprocity and gift exchange. 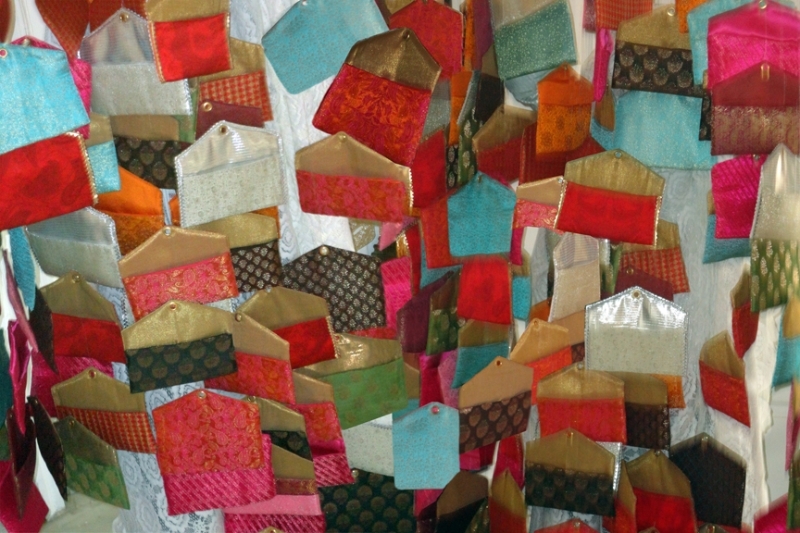 It consists of a mobile site specific installation created with 101 envelopes, 7×4 inches each (batuhas) made of silk brocade fabric textiles hanging from the ceiling attached with sacred thread mouli (red,yellow colour) used for festive and joyous occasions. Laura Kina is an Associate Professor of Art, Media, and Design and distinguished Vincent de Paul Professor at DePaul University in Chicago, IL. She is a graduate of University of Illinois at Chicago (MFA 2001) and the School of the Art Institute of Chicago (BFA 1994). Born in Riverside, California in 1973 to an Okinawan father from Hawai’i and a Spanish-Basque/Anglo mother, Kina was raised in Poulsbo, WA, a small Norwegian town in the Pacific Northwest. The artist currently lives and works in Chicago, Illinois. She has shown extensively in the US and internationally and her academic work has been widely published. Omiyage features a series of four fabric panels that portray segments of story of the artist’s father and his relationship with his absent father. The title for this series refers to the Japanese tradition of omiyage, small gifts wrapped in ornately decorated handmade fabric, while the form of the paintings derives from the patchwork quilt tradition which is a common baby gift in Hawaii. Saira Wasim is a noted USA-based contemporary artist from Pakistan. She has carved a niche for herself with her innovative and meticulously crafted Persian miniatures, which she employs to make devastating political and social commentary. Her work has been widely feted, and has been exhibited at numerous prominent art institutions in the USA and abroad. The artist was born in Lahore, Pakistan, and currently lives in California. Wasim’s work has always been politically charged and reflects her background and the transition ‘between’ her old and new worlds; stylistically the works are deeply committed to the tradition of Mughal miniature painting. This centuries-old art practice involves a very strict discipline and is a constructive process; it takes months to finish a single small-size painting. For this exhibition the artist created a 5-minute animation film entitled Lines of Confrontation through which she comments on the nature of the ‘strange aid packages’ sent to Pakistan from the USA. Anida Yoeu Ali is a performance artist, writer and global agitator, who is a first generation Muslim Khmer woman born in Cambodia and raised in Chicago. Utilizing video, installation, sound, and performance, her works investigate the artistic, spiritual and political collisions of a hybrid transnational identity. She is a collaborative partner with Studio Revolt, an independent artist-run media lab that produces films, videos, installations and performance projects in Phnom Penh, Cambodia. She is a recipient of the 2011 U.S. Fulbright Fellowship to Cambodia where her art and research focused on creation mythologies and birthing stories of Khmer women. The work in the show belongs to the Gallery X series: a participatory project, comprised of digital portraits and a site-specific installation that engages “everyday” communities in art-making and art-viewing. Specifically, the project continues Studio Revolt’s interest in creating narratives of Cambodians by Cambodians beyond war and poverty. Gallery X is a series of public portraits capturing people caught in a moment between heaven and earth—an exhilarating moment of joy. These “jumpshot” portraits became a way to spread joy amongst artists, participants, and viewers. Ombretta Agrò Andruff is a New York City and Miami-based freelance curator, art critic and consultant. Born in Turin, Italy, in 1971 she graduated from the University of Art and Literature in Siena, Italy, in 1995 and holds a post-graduate degree in International Cultural Management from the ICCM in Salzburg, Austria, and Fitzcarraldo Foundation in Turin, Italy. Since her move to the USA in 1998 she has curated solo and group shows in Europe, the USA, and India, collaborating with museums, art festivals, commercial galleries and art fairs. She has written essays for several books and catalogues. Since 2005 she has been a consultant to the Italian Cultural Institute in New York City and the Italian Ministry of Cultural Affairs. From 2007 to 2012 she consulted the Religare Arts Initiative, a New Delhi-based art organization, as their International Art Advisor. Storytelling and a deep interest in history and untold stories is a shared strategy amongst this collective of interdisciplinary artists. The core group of proposed artists includes: Shelly Bahl (born in Benares, living between New York and Toronto); Shelly Jyoti (Born in Rohtak, living in New Delhi); Laura Kina (born in Riverside, CA, to a Japanese father and Basque/Anglo mother, and living in Chicago); Saira Wasim (born in Lahore, living in Chicago); and Cambodian-American Anida Yoeu Ali (currently living in Phnom Penh, Cambodia). In a grass roots diplomatic effort, they are collaborating with an Italian, New York-based curator to conduct a trans-cultural dialogue between their works, their countries of origin, and the intersections and migrations between. Shelly Bahl is a visual and media artist born in Benares, India, and currently based in New York City. Her artwork has received significant critical attention, and has been reviewed in the New York Times, Time Out Delhi, NOW Magazine, National Post, Hamilton Spectator, Asian Art News, World Sculpture News, Art India, Vancouver Sun, Art Asia Pacific, New Art Examiner, FUSE Magazine, and other publications. Shelly Jyoti is a New Delhi based visual artist, fashion designer and a poet whose research centers on historical iconographic elements within the cultural context of Indian history. Her art series ‘Indigo Narratives’ (2009-12) and ‘Beyond Mathila’ (2008-12) have been shown nationally/internationally and have been reviewed, interviewed by leading national art magazines/news papers like Business standard, Economic Times, India Today , Art Etc, Art India. Her literary and art works have been published by Sahitya Akademi, the journal of Indian English literature. Anida Yoeu Ali is a performance artist, writer and global agitator, who is a first generation Muslim Khmer woman born in Cambodia and raised in Chicago. Utilizing video, installation, sound, and performance, her works investigate the artistic, spiritual and political collisions of a hybrid transnational identity. Anida is a recipient of the 2011 U.S. Fulbright Fellowship to Cambodia where her art and research focused on creation mythologies and birthing stories of Khmer women.